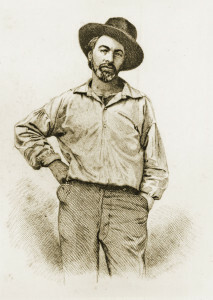 Walt Whitman, 1855 “Leaves of Grass” portrait. My dog Sam and I have lapsed into the familiar. These days I seem to frequent only restaurants I know, ordering the same menu items time after time. For his part Sam, whenever he senses I’m about to vary from a customary walking route, stubbornly plants four paws until I turn the way his snout points, that is, the way he knows. You might think these acts show we’re rooted in the past. In fact we’re looking toward the future. My health is good and so is Sam’s. But neither of us takes the passage of the seasons for granted, nor sunrises and sunsets. The turning of the earth, after all, is constant, just as memory is constant, even in its loss. But the turning, and memory, we’re all required to leave behind. Our time is finite. Some days we pause on our walks, and Sam reclines on his haunches like a sphinx. I begin to read aloud to him. If the autumn sun is warm, he may yawn contentedly, as he listens patiently to the words of Walt Whitman. I close the book, comforted. Sam stands, ready to travel. “You’re a good dog,” I say to him. He wags his tail, letting me know he believes I’m a good dog, too. That is the secret we share. Posted in Blog and tagged leaves of grass, walt whitman.